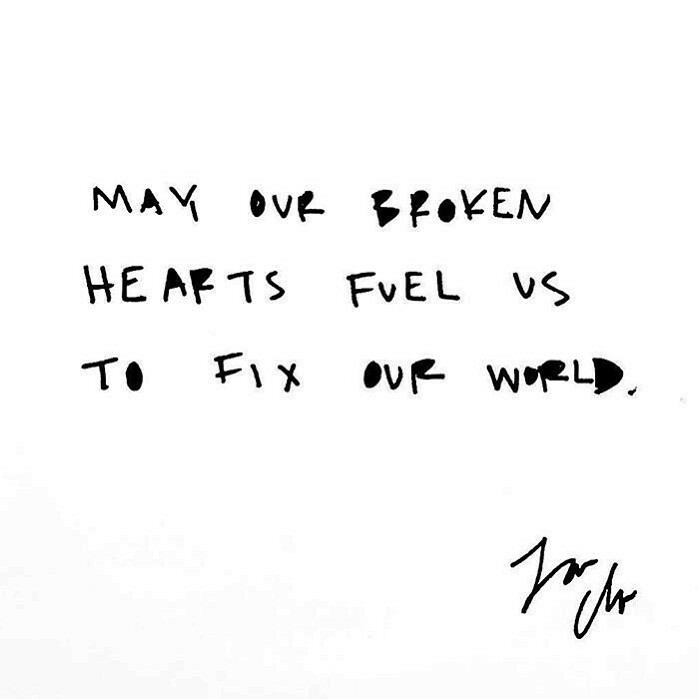 Dear friends, may our broken hearts fuel our VOTES today. My heart broke when innocent lives were lost at the hands of a gunmen — at a school, a synagogue, a concert. My heart breaks when immigrants, asylum seekers and Muslims are viewed as dangerous when white males are those gunmen who are terrorizing our country. My heart breaks when I realize how me and my ancestors have benefited and continue to benefit from a racist, capitalist system; my life is easier and more privileged than folks of color because my intelligence, thoughts, behavior, intentions (walking down a street, driving a car, shopping in a store), and more have never been second guessed or doubted simply because my skin is white. My heart breaks to hear parents of color having to sit their kids down at a tender age to give them “the talk” about how to navigate and survive in a country that portrays them, by default, as dangerous and suspect due to how they look. My heart breaks when families risk their lives to get away from violence in their home country only to be thrown into cages and ripped from their babies at the hands of our government. My heart breaks when women’s bodies are treated like objects and violated yet we’re shamed and not believed when we speak up and out against that pain. When our pain doesn’t matter in the face of protecting the power and reputation of white men. My heart breaks when LGBTQ+ folks are denied the fullest expression of their identity, humanity and love for another human because our society protects heteronormativity and misogyny. My heart breaks when white women choose to vote for whiteness instead of voting *against* sexism, racism, and even pedophilia. When they show up for the Women’s March but not Black Lives Matter. My heart breaks when white women vote like white men because they think the patriarchy will feed them when in fact it’s poisoning and starving them (and our country). My heart has been broken over and over again by conservatives. Anyone would tell someone in this relationship that it’s toxic. To leave. Vote today to heal our country.